Part of the aim of this residency project is to link artists with different practices and backgrounds. 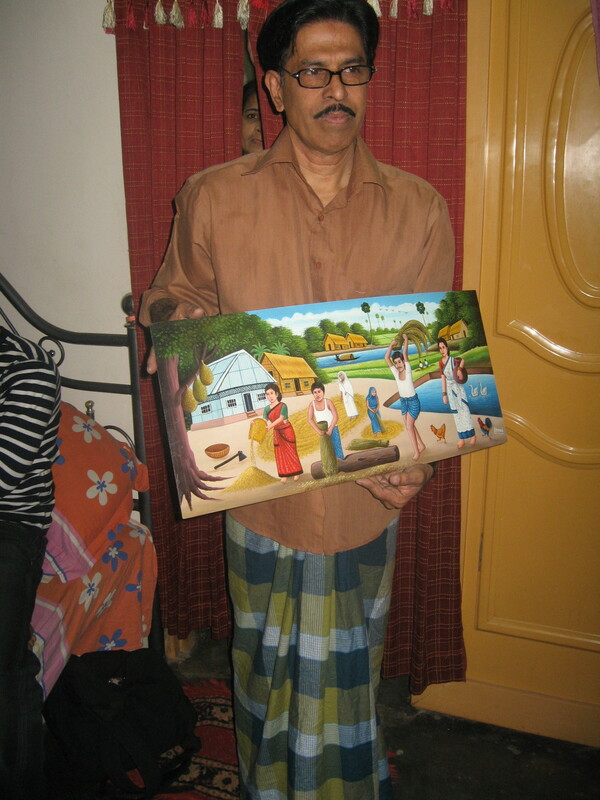 One of Bangladeshi artists is called Tapun and he is a rickshaw painter. We visited the workshops where they make rickshaws and saw the whole process from painting the panels thru to making the vehicles. 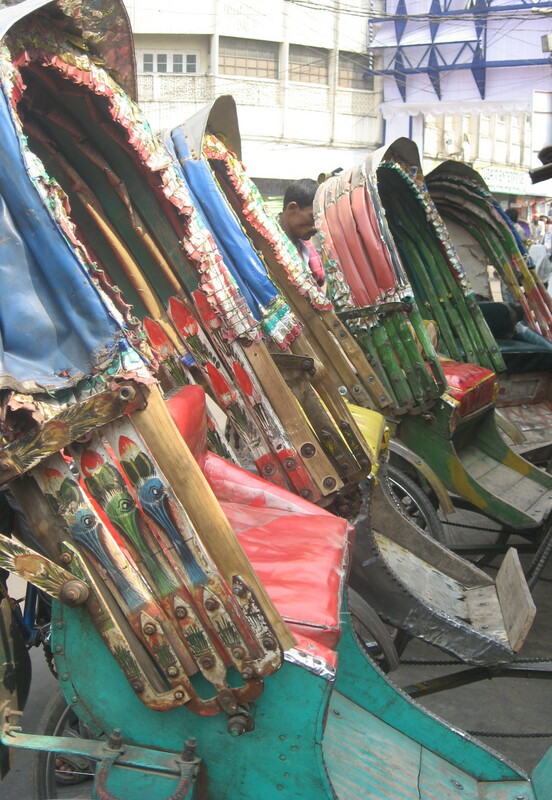 There is a fascinating history and culture surrounding these rickshaws, their makers and pullers. The exhibition as part of this project will reveal some of it. 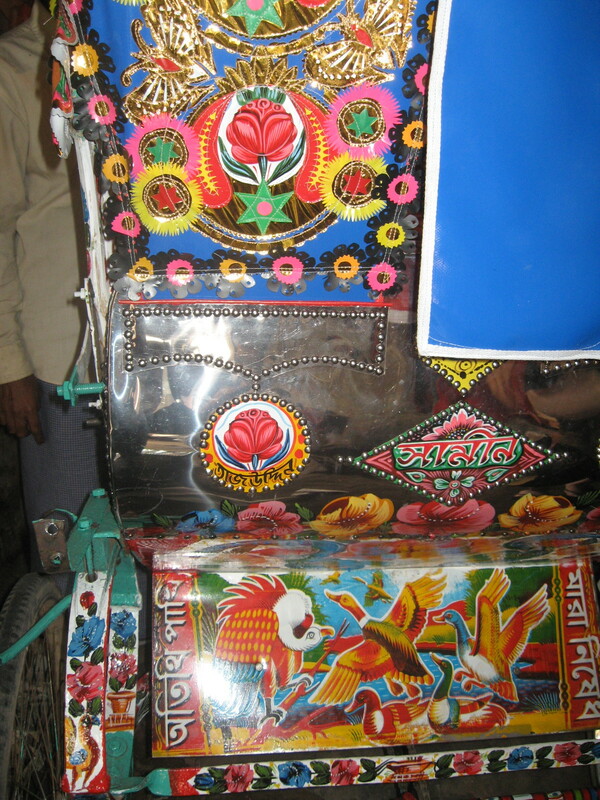 I had no idea that rickshaws only came to Bangladesh in the 60’s, and the paintings on them are done by local craftsmen (see debate between art and craft! ), often for quite political ends. The paintings are done on tin panels and have a unique style. Tapun showed us some of his work and that of his father and brother. They are beautiful! 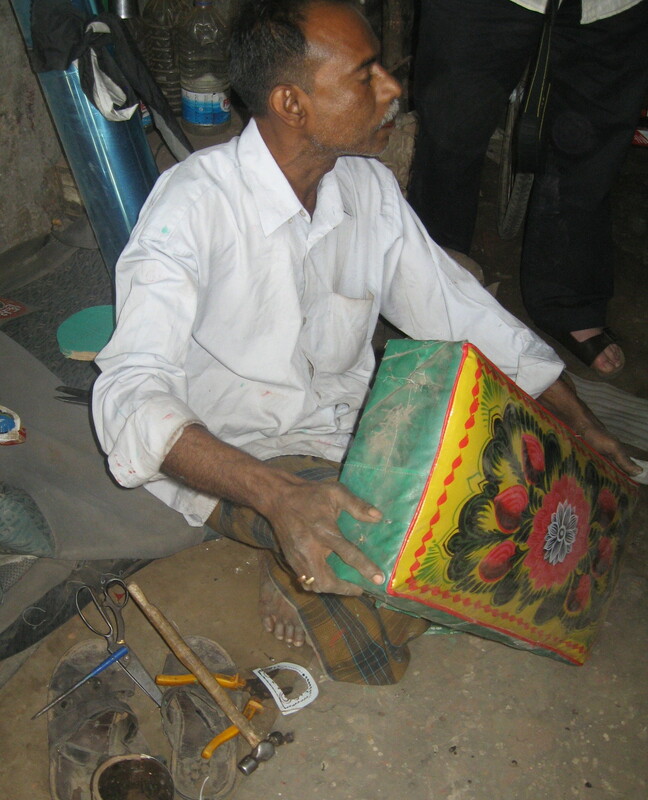 I have commissioned him to make me a small painted tin box to take home. It seems there are various skill levels, and those who paint on vinyl and sew the appliqued panels, as well as those who paint on tin and wood. I loved the tiny metal nails they use to attach the panels, which become almost like decoration. I have collected some to try and incorporate into my work somehow. Not such a good image as the workshops are dark and my photography skills need improving. 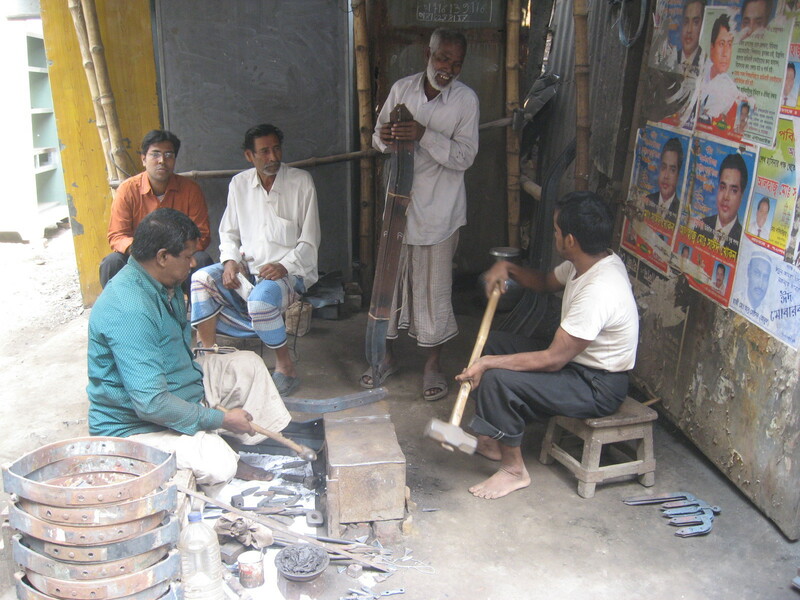 It is amazing how the artisans work in such basic conditions, sitting on the floor with little good light and no health and safety concerns. They seem to work extremely long hours too. Some of the more well known painters are now selling work to tourists (like me!). One painter showed us some very cheesy commissions he had done incorporating holiday snaps of tourist clients. 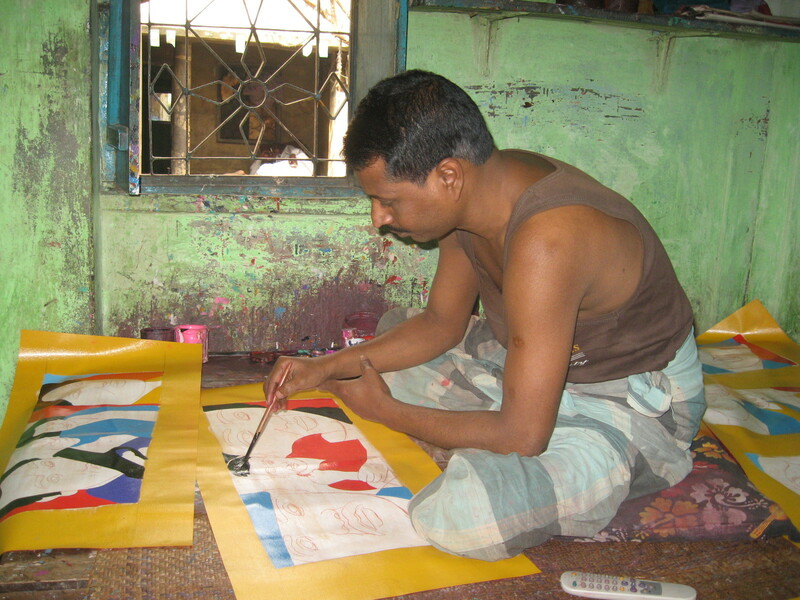 Still, it is part of the changing economic culture of Bangladesh and as rickshaws die out, as they will, the artists will need to diversify. The experience I have had of riding in rickshaws is jaw-clenching. In the day they happily bump and scrape into eachother in the heavy traffic and will launch themselves across the flow of two lane traffic shouting and bell-ringing (I just close my eyes and hang on for dear life!). At night there is less traffic but no few street lights and none of them have lights, despite the pace they travel. It is amazing there are not more accidents! 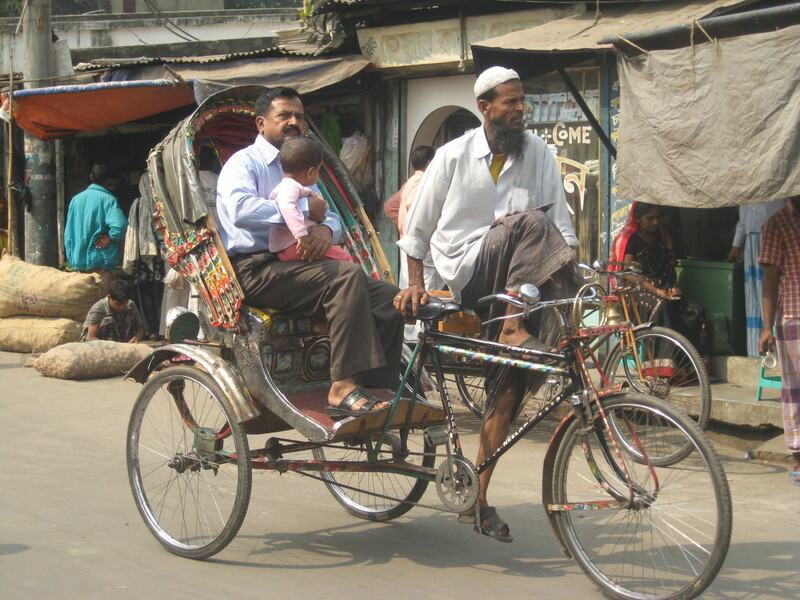 The rickshaw pullers are often men from the country come to try earn a living. Many of them hire their rickshaws by the day and try make enugh money to pay back the owners. I was sad to discover that many of them cannot read.